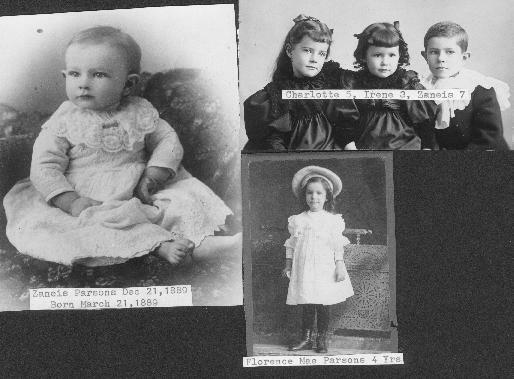 Charles Alfred Parsons, the 4th child and 2nd son of Charles Parsons and Maria Bagnell, was born in Zanesville, Ohio. He grew up there. When he was 19 he went to Kansas to work on a farm. He worked on the stock farms of Mason , Wiles and Potwin near Eldorado, Kansas. Later, his brother, William, decided to make his home there also. The two brothers negotiated a trade for 160 acres of farm land about 12 miles from Eldorado for their house in Zanesville, OH and the rest of the Parsons family (father, mother, brothers & sisters) moved there in about 1881. 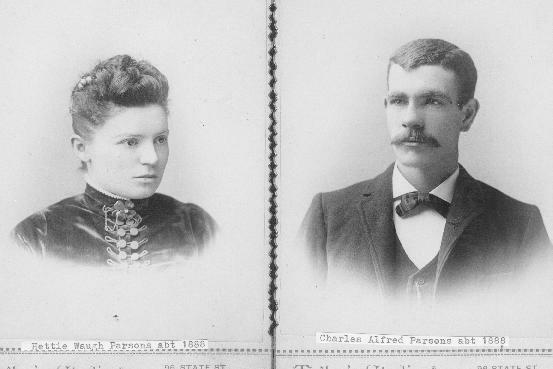 Charles married Hattie Waugh in about 1888 and lived in Chichago, IL for several years, where their first 3 children were born, Zaneis (1889), Charlotte (1890) and Irene (1894). Charles and Hattie lived in Marshaltown, IA ( dau, Florence Mae b. 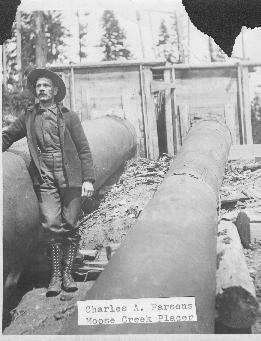 1898) and Grangeville, ID ( son, Alfred Waugh Parsons b. 1906) before moving to Longview, Washington for the rest of their lives. The rest of the Parsons family lived in Edorado, Kansas until coming to Denver about 1893 (from the story of another brother, Robert Parsons). Maria Bagnell Parsons, his mother, died in Eldorado in 1886. 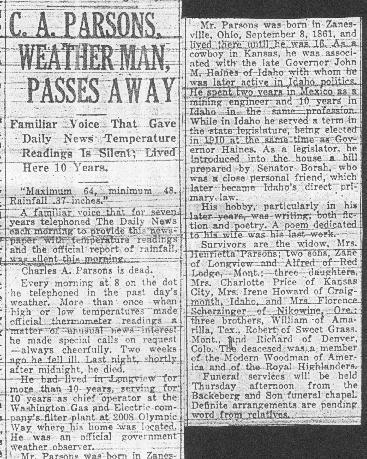 Charles obituary appeared in The Daily News, Longview, WA March 7, 1933.